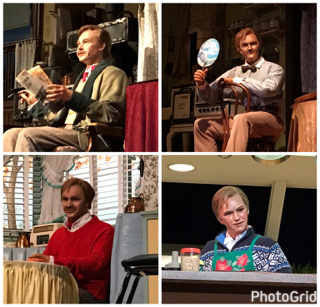 I sat in the front row of Carousel of Progress today, and was able to get some close ups of the father in each scene. Since several guests decided to break the rules and leave early, we sat through two of the scenes twice. It was the first time I have seen this scenario happen two times during the same show. I thought it would be appropriate to post a shot of something special for my 2000th photo. It doesn't get more special than the "big cheese" himself. 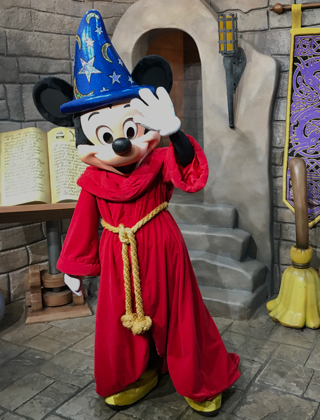 I took this shot of Mickey last week at Hollywood Studios. As I hit this milestone, I want to thank all of you who continue to enjoy my daily photos from all around Walt Disney World. Today was one of those "picture perfect" days in Central Florida. There were no clouds in the sky, and the air was dry. 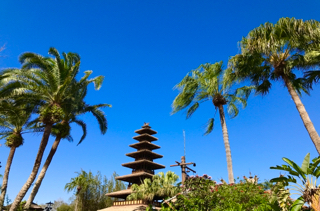 I was standing in the Jungle Cruise courtyard when I snapped this shot, looking toward the Enchanted Tiki Room. 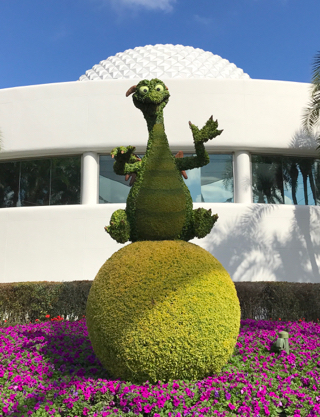 Today, I gave a tour at Epcot. I like to take my guests to "The Seas" early in the day, when there are very few people there. 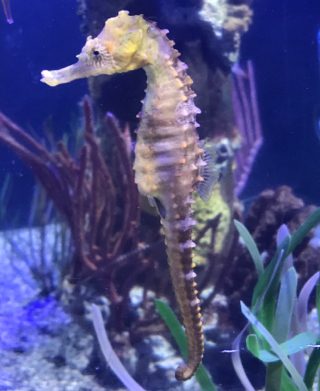 I took this shot in the tank containing seahorses and starfish. 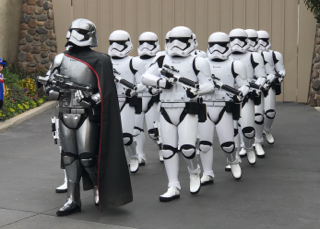 The March of the First Order is a parade of stormtroopers that takes place many times each day, at Hollywood Studios. Star Wars continues to grow at this park, with the huge new land scheduled to open in just two years. I took this shot while giving a tour a few days ago. This will probably be the last photo I ever post of the Streets of America section of Hollywood Studios. The building on the right of this shot is the last remnant of "New York City" that is still currently standing. This construction zone is where the new "Star Wars land" will open in 2019. 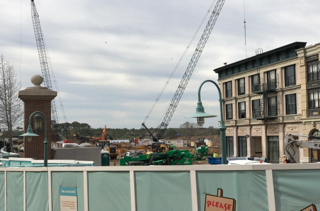 Although it was sad to see the Streets of America torn down, I am certainly excited about what is to come. 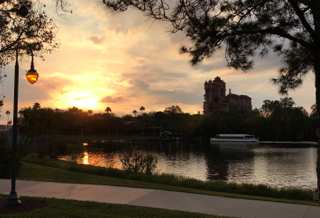 As I was leaving Hollywood Studios yesterday, I took this sunset shot. Tower of Terror is an impressive structure that defines the skyline of this park. I was walking along the sidewalk near the bus stops when I took this shot. 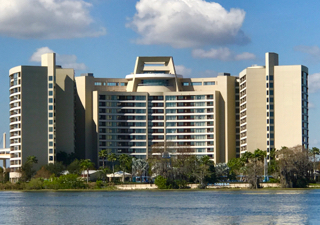 he front of Bay Lake Tower is seen by tens of thousands of guests on a daily basis, as the monorails pass right by this resort. However, only those on a watercraft on Bay Lake can see the backside of the hotel. I was on a boat from Magic Kingdom to Fort Wilderness, when I took this shot yesterday. Wilderness Lodge is undergoing a major refurbishment and expansion. Part of this is the new Geyser Point Bar and Grill. 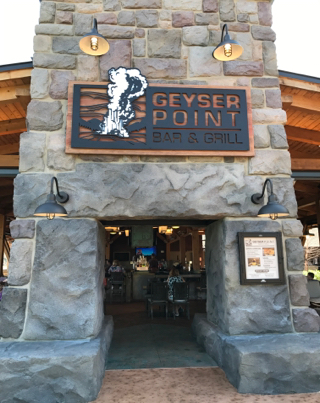 Located right on Bay Lake, this open air eatery is a nice quick service addition to the resort. I had lunch there today, and enjoyed the food and the atmosphere. 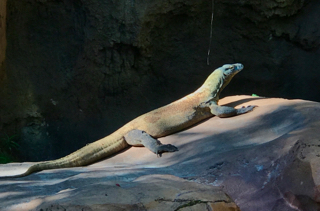 The Komodo Dragon is one of the more dangerous animals that can be seen in Animal Kingdom. 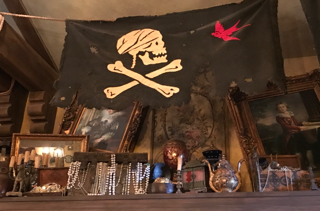 It is located in the area just inside of the entrance to Maharajah Jungle Trek. He was in a great spot, sunning himself on a rock, when I took this shot a few days ago. Anna and Elsa have recently moved back to Epcot, where they first began greeting guests more than 3 years ago. 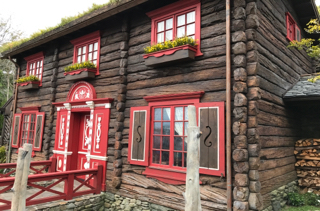 The Royal Sommerhus was added to the Norway pavilion last year, and is the sisters' "summer home." 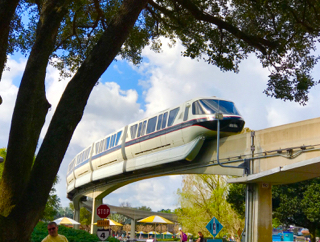 I took this shot today, while my tour guests were enjoying Frozen Ever After. It was a beautiful day in the Magic Kingdom. 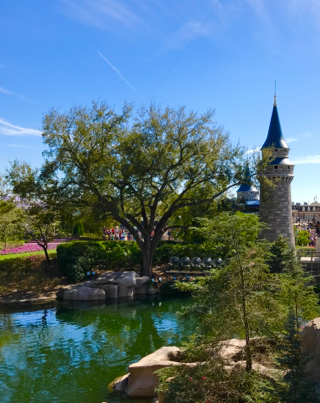 As I was waiting for my tour guests to finish lunch at Cinderella's Royal Table, I was standing next to the castle looking toward the moat. 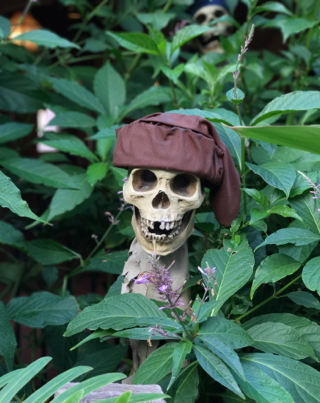 I thought it was a nice spot for a photo. For the most part, Dinoland in Animal Kingdom is home to replica and audio animatronic dinosaurs. 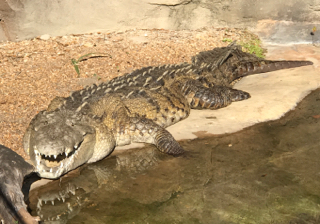 However, this very large American Crocodile lives in this area, and is very real. It looks like a modern version of a dinosaur, and the nearby cast member called it a "living fossil" today. 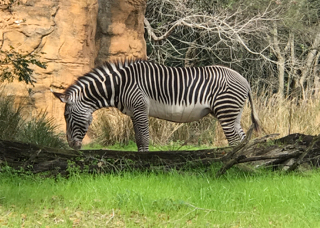 Zebras are native to Africa, so naturally they would be found in that section of Animal Kingdom. They are on Gorilla Falls Exploration Trail, in the same area as the meerkats. 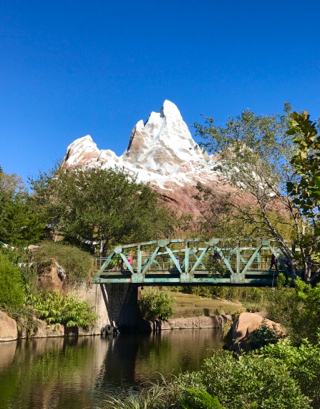 I took this shot while giving an Animal Kingdom tour this morning. 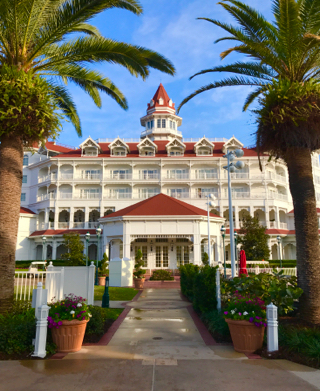 The Grand Floridian is an impressive resort, and I've taken hundreds of photos there over the years. This morning, I walked from the parking lot to the main lobby to meet my tour guests. I was standing near the Beach Pool entrance when I snapped this shot. 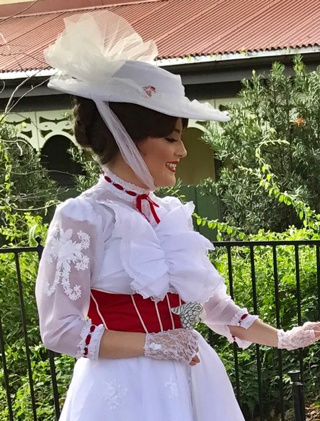 Mary Poppins has been greeting guests in the gazebo in Liberty Square lately. This spot was previously occupied by Tiana, who recently moved to Princess Fairytale Hall. There was a nice short line to meet Mary, when I brought my tour guests there. 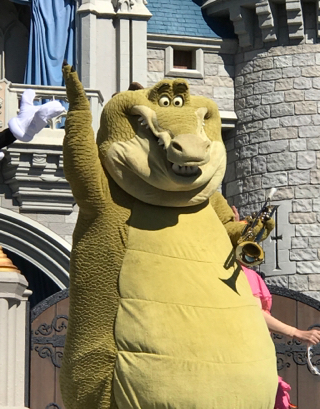 Louis, the trumpet playing alligator, is a beloved character from The Princess and the Frog. 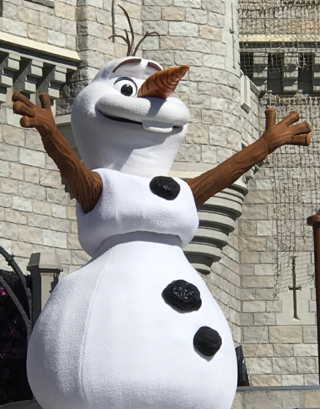 He is also one of the stars of the newest castle show at Magic Kingdom. I took this shot while giving a tour at the end of January. Tonight, Animal Kingdom guests were treated to a preview of Rivers of Light, a new nighttime show officially debuting next week. It is a visually beautiful production, with an amazing soundtrack. 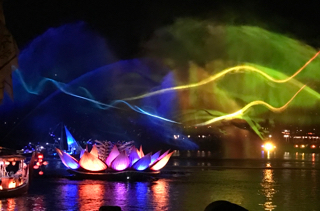 It is a very unique show with water, laser, and fire effects that come together in a grand way with an animal theme. The Flights of Wonder show has been entertaining and educating Animal Kingdom guests for many years. Prior to the show, a handler typically comes out in front of the theater entrance with a "special guest" bird. 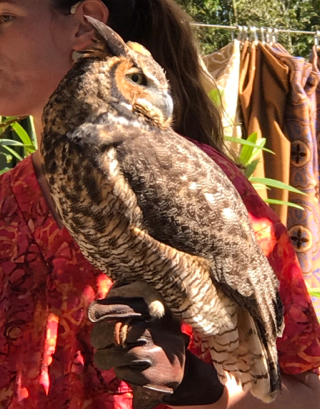 I took this shot of Tuesday the Owl while giving a tour last week. The All-Star resort is a large complex containing more than 5,500 guest rooms. It is divided up by three different themes: Sports, Music, and Movies. 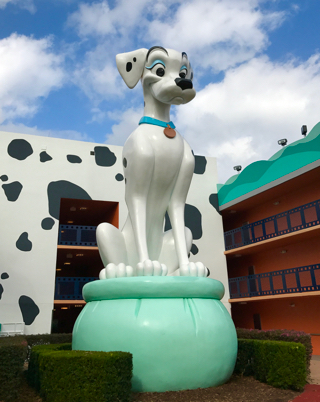 I was at All-Star Movies, when I took this picture in the 101 Dalmations section of the resort. 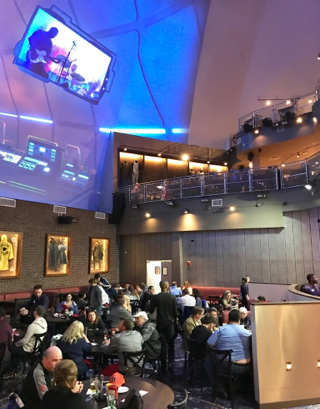 Planet Hollywood at Disney Springs has been under refurbishment for a while, and recently re-opened. I had a chance to check it out last week. It has an "observatory" theme now, with giant new video screens high on the dome. It is more modern looking, but didn't have as much movie memorabilia as the original version.